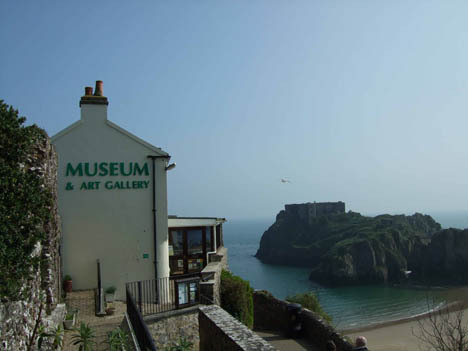 Tenby Museum & Art Gallery, established in 1878, is the oldest independent museum in Wales. Over the years it has collected together a fine and diverse collection of art featuring internationally renowned artists such as John Piper, Kyffin Williams and David Jones (all of these works are in a medium other than oil). The earliest oil in the collection is by William Golding, entitled ‘Tenby from North Cliff’, dating from 1799. The museum has been the fortunate recipient of the generosity of artists and donors as well as receiving the support of grant aid bodies in adding to its collection. The museum continues to collect works with local relevance, either in subject matter or through the artist’s biography. Among the most important works in the collection are paintings by Gwen and Augustus John, who both had strong connections with Tenby. One of the most interesting works is ‘Landscape at Tenby with Figures’, dating from c.1896/1897 by Gwen, rare not only in its age but also in the fact that it depicts the town of her childhood.